Together with you, MTF Biologics has placed more than 8.6 million allografts, delivering on the promise of the highest quality tissue and outcomes for your patients. From start to finish, quality is at the forefront of everything we do. 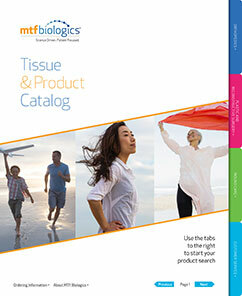 MTF Biologics maintains the most stringent donor screening process of any tissue bank – exceeding the industry standards all tissue banks must follow. But our commitment to quality doesn’t end there. MTF Biologics believes in minimal processing to maintain the biomechanical integrity and biochemistry of every graft. Our unique aseptic processing method ensures optimal tissue quality, by minimizing the use of harsh chemicals and terminal radiation. In conjunction with our distribution partners, OrthoFix, Depuy Synthes, and ConMed, MTF Biologics offers one of the largest portfolios of orthopedic and sports medicine tissues, ranging from bone void fillers like Trinity ELITE® a viable cell allograft to our clinically tested and proven tendons for ACLR’s. Osteoconductive scaffold is provided by the cancellous bone component that serves as a natural trabecular bone matrix. It provides a porous, interconnected scaffold for bone ingrowth. Osteoinductive signals are derived from the demineralized cortical bone component, which has been shown to possess active, essential growth factors. Osteogenic cells, such as mesenchymal stem cells (MSCs), osteoprogenitor cells (OPCs), and bone forming cells are native to the cancellous matrix. Size appropriate and procedure specific grafts are crucial to what you do. And it’s important to us, too. That’s why MTF Biologics offers matching for our large grafts, meniscal, and fresh osteochondral allografts, with the goal of providing the best anatomically matched allograft tissue for your patients. This service saves you valuable surgical time, by reducing extensive modifications during transplantation. Once we achieve a match, we discuss all information and data with you for final acceptance. Contact MTF Biologics at 800-433-6576 (1-732-661-0202) or by email at GraftMatching@mtf.org. Our clinical research drives our continuous improvement. Several peer-reviewed studies demonstrate that our commitment to aseptic processing – avoiding the use of terminal irradiation – results in reduced failure rates and greater cellular activity and incorporation compared to tissues treated with harsh processing methods. Revision Risk After Allograft Anterior Cruciate Ligament Reconstruction: Association With Graft Processing Techniques, Patient Characteristics, and Graft Type. Revision rates after anterior cruciate ligament reconstruction using bone-patellar tendon-bone allograft or autograft in a population 25 years old and younger. * Maletis, Gregory, et al. “Increased Risk of Revision after ACLR with Soft Tissue Allograft Compared to Hamstring Autograft.” ISAKOS. 6 June 2015. ePoster #1219. 1 Data on File, TR14-464-12/1/14. Individual pictured is not a surgical patient. Results may vary.